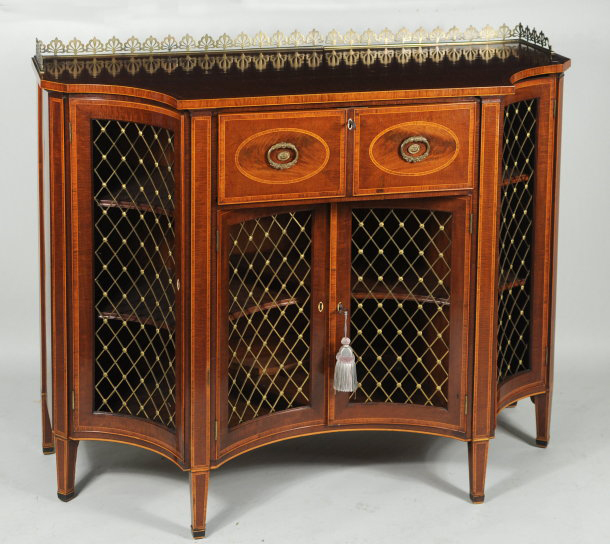 Thomas Schwenke, Inc. 50 Main St. North Woodbury, CT 06878 fedfurn@schwenke.com www.schwenke.com Regency Butler's Serving Cabinet Very rare superb quality London made satinwood and inlaid butler's serving cabinet, with pierced brass galleried top above a central pull-out desk section with leather fold down writing board, above a pair of concave bronze grillwork central doors, flanked by an outer pair of like bronze grillwork doors, raised on inlaid short tapered legs, with fine inlaid details throughout. England, circa 1815-20. 40" high, 52 1/2 wide, 29 1/2" deep.